Let the power of the sun light up your night! This 12' string of Solar LED Patio Lights is really incredible! 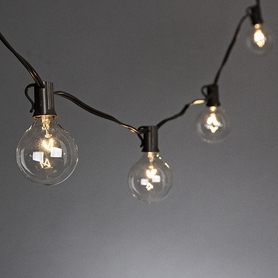 It features 20 warm white solar powered Rocket style LED filaments with clear glass globes that are 1.5" in diameter. Rocket LEDs produce a warm light and combined with solar powered technology, this hi-tech product is sure to be the envy of your neighborhood! The solar panel converts sunlight into electricity and charges the replaceable AA battery (included). After a full day of sun exposure, the built in sensor will automatically turn on when it's dark and off when it's light. On the backside of the solar panel, push the switch side-to-side to set the panel off (when storing the product), to set the lights to flashing or solid. In flashing mode, the lights flash for a split second and go off for about 1 second. This set comes with a switch protection accessory which doubles as a surface mounting bracket to mount the solar panel on a roof, window, door or fence and you'll also receive a 4" ground stake to mount the solar panel in the ground. 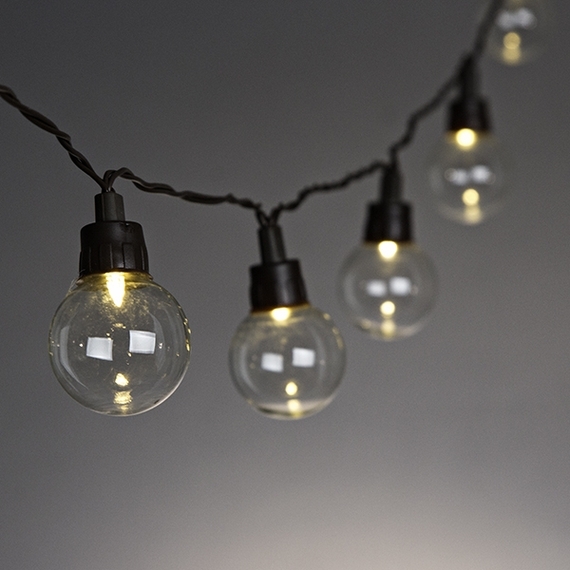 Other features include: 12' total lighted length on brown wire with a hook behind each light to hang the strand, working voltage of 3V, 6' long leaDecord from solar panel to the first connector, 8" bulb spacing and a complete set of thorough instructions. Another plus is that you can string to string connect up to 3 sets of these Solar LED Rocket Lights and power them off of 1 solar panel! So many places to use these magnificent lights courtesy of the mighty sun! Please note: Although the directions say to remove the protective film from the solar panel before charging the battery, we noticed that there was not a film cover on the units we tested. We don't want you to mar the surface of the power source. The selling information clearly states that these patio lights are for outside use - solar! The box states "indoor" use. This was a concern for me, so I emailed them. They responded immediately telling me to let them know if problems develop. Hopefully, the investment I made will shine for years. Merchant Response:Thank you so much for your order and for contacting us. We are here to help anytime you have a question or concern. Enjoy your lights. I get a lot of sun and have no exterior electric outlets, so I prefer solar lights for my deck. 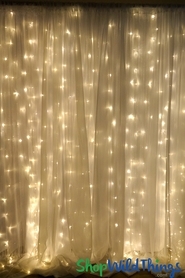 These lights give a warm, subdued glow at night. They come with a mini-solar panel you can stake into the ground (stake included) or screw to a flat surface (screwplate included). There's plenty of line between the solar panel and the start of the bulbs on the string, so you have good freedom to put the panel where it'll collect plenty of sunlight. Tilt it so it's looking upward and to the south for best results. Merchant Response:We are so happy to be able to offer the option of solar lighting and thrilled that you are pleased with them too!! Thank you for your comments.